Black_A7_Envelopes_-_5_14_x_7_14 is rated 5.0 out of 5 by 4. Rated 5 out of 5 by CBMArtworks from Very Pleased Great product. Very satisfied with the envelopes and the customer service that was provided. I'll be returning! Hi Matthew. Sorry but we do not do any custom printing. Hello! Unfortunately, this style is not available in 9&quot; x 12&quot;. Sorry for any inconvenience this may cause. Ever wonder why blackboards are never called green boards even if they're sometimes technically green? It's because black doesn't only sound better, but it's a sleeker and greater color. (Sorry green envelopes). Use this envelope to ask someone to prom! It might not be that extravagant in gesture, but sometimes simplicity will win over a heart more than a scavenger hunt that takes the entire day. Not a student anymore? These envelopes are great to give out to your students' parents when they were misbehaving. The student will take one look at the envelope, be intimidated, and never behave badly again. Not a teacher? Use these envelopes for that soccer mom party so that all of the other moms get jealous of your great taste! Any way you use this envelope, it will have a productive effect! Don't forget that! 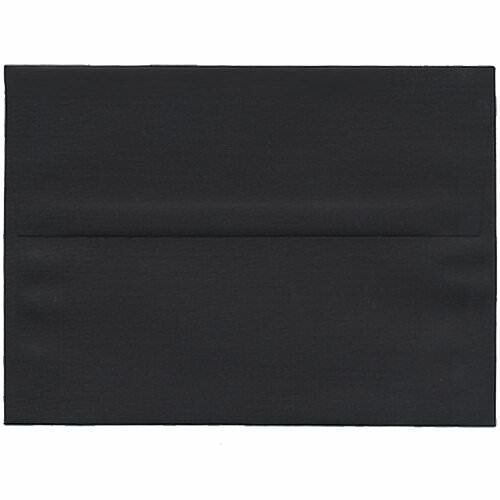 Black A7 Envelopes measure 5.25 x 7.25 are available in Black Linen, Smooth Black, Metallic, Square Flap, Vlfap, and Foil Lined. Also known as Black 5x7 envelopes.